Tianhe became a district in the 1980s as the city expanded its size. Back then, it was east of Dongshan District (which was merged into Yuexiu in 2005) and it was more suburban like if not rural like. Even though a majority of colleges and universities in the city were located in the district, the rest of the district was mostly composed of rice fields. Symbolic landmarks of Guangzhou located in Tianhe District are: Citic Plaza, Guangzhou International Finance Center, Guangzhou Opera House, and the Guangdong Museum. The 6th and 9th of The National Games of the People's Republic of China, and the 2010 Asian Games were also held in Tianhe District, Guangzhou. Prehistoric population settled in what is now Longdong Subdistrict (龙洞村) in the Neolithic Period. Eastern Han tombs were discovered in Tianhe. During the Song Dynasty, Tianhe area was called Dashuixu (大水墟; 'large river town'). The area of modern Tianhe District was part of Panyu County for more than two thousand years. The area was gradually put under Guangzhou's administration between 1937 and 1958. By the liberation of Guangzhou (October 1949), there were two districts in Tianhe area, namely Shahe (沙河区) and Shipai (石牌区). 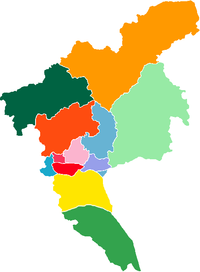 In 1951 both districts were merged into the newly established Baiyun District, while five years later Baiyun was further merged with Huangpu and Xinjiao Districts to form suburban district (郊区). In 1960 Jiaoqu was dissolved and the area consisting of modern Tianhe became Huangpu District, however it was reestablished two years later. In 1985 part of Jiaoqu was split, and Tianhe District was established then. In 1987 Tonghe Town (同和镇) was put into Baiyun District. In 1992 Yangji Cun was put into Dongshan District. By 1994, Kemulang (柯木塱), Yushatan (渔沙坦), and Fenghuang (凤凰) Farms along with Shadongcun (沙东村) and Erduicun were placed under Tianhe's jurisdiction. In 2000, former Xintang (新塘), Mubei (沐陂), Lingtang (凌塘), and Yushu (玉树) Farms were also placed under Tianhe and the farms gradually became subdistricts. The first big project built in the district during the 1980s was the Tianhe Sports Center when the city was selected to host the Sixth National Games in 1986. The complex includes a stadium of 65,000 seats, a gymnasium and an indoor swimming pool. Its construction had a lasting impact on the development of the district. Soon other projects followed and rice fields gave away to residential complexes called "xiaoqu" (meaning "little districts"). The construction of xiaoqu began in the mid and late eighties and most of them had residential buildings of no more than 10 stories. Each floor was kept to no more than four units due to the lack of elevators since they would increase the construction cost. Also, due to the sheer number of residential buildings – some xiaoqu had more than 20 residential buildings – a lot of land was needed and thus converted. The building of Guangzhou East Railway Station in 1990 further contributed to the growth of the district. The old Guangzhou Railway Station is 10 km (6.2 mi) to the west and was the terminus for trains to and from Beijing and Hong Kong. To relieve the traffic, the East Railroad Station was built and is now the terminus for trains to and from Hong Kong and Shenzhen. As the district developed, the size of xiaoqu became smaller since land became more valuable and expensive. Most of the new xiaoqu now only consist of four to six residential buildings but each can contain 30 floors or more since the growth of district attracted big developers where the cost of construction (such as elevators) was no longer an issue. Also, taller residential buildings gave rise to taller office buildings. South of the Sports Center and north of the Zhujiang River is Zhujiang New Town, an area desolate a decade ago but which is now one of the fastest-developing areas of Guangzhou. Many of Guangzhou's newest and most iconic buildings are found in this part of the district. Several venues used for the 2010 Asian Games are located in Tianhe District. Google has its Guangzhou office in Teemtower (天河城大厦) of Teem Plaza. All Nippon Airways operates its Guangzhou Office in the district. Since May 3, 2011 it has been located in Tower A of Victory Plaza. On May 2, 2011 and prior, it was located in the 2605 CITIC Plaza. Renren.com has its Guangzhou office in China Shine Plaza (耀中广场). 56.com was headquartered in Huajingyuan (华景园) in Tianhe Software Park (天河软件园) when it was an independent company. The Consulate General of the United States, Guangzhou is in Zhujiang New Town, Tianhe District. CITIC Plaza, an 80-story, 391 m (1,291 ft) skyscraper completed in 1997, situated between Tianhe Sports Center and Guangzhou East Railway Station. It was the tallest building in China then, and now it ranks as the 3rd tallest building in Guangzhou, 8th in China, 11th in Asia, and 16th worldwide. Pearl River Tower, a skyscraper in Zhujiang New Town, which is the first zero-energy building in China. It is owned by China Tobacco. Guangzhou International Finance Center, a 435 m tall skyscraper. It was built between 2005 and 2010. Guangzhou CTF Finance Center, Currently it is the tallest building in Guangzhou. The famous shopping mall, TeeMall, a very big shopping centre, the Chinese from Guangzhou even call it the biggest shopping mall in Asia (although the biggest mall in Asia is actually the Golden Resources Mall in Beijing). ^ 2014年广州市人口规模及分布情况 (in Chinese). Retrieved February 13, 2014. ^ Cai Wei Ming (蔡维明) (1992). 广州市天河区文物志 [The Annals of Cultural Relics in Tianhe, Guangzhou] (in Chinese). 天河区文化局 [Tianhe District Bureau of Culture]. ^ Chen Dazhen (陈大震); Lv Guisun (吕桂孙). Dàdé Nánhǎi zhì 大德南海志 (in Chinese). ^ Population Census Office, State Council; Department of Population and Employment Statistics, National Bureau of Statistics of China (2012). Zhongguo 2010 nian renkou pucha fen xiang, zhen, jiedao ziliao 中国2010年人口、普查分乡、镇、街道资料 [Tabulation on the 2010 population census of the people's republic of China by township] (in Chinese) (1 ed.). Beijing Shi: Zhongguo tongji chubanshe. ISBN 978-7-5037-6660-2. ^ "Life of Guangzhou - Master Plan of Guangzhou Science City". www.lifeofguangzhou.com. Retrieved April 8, 2018. ^ "Company Overview of Kungfu Catering Management Co., Ltd." Businessweek. Retrieved on August 17, 2014. "16Floor, Gaosheng Building No.109 Tiyu West Road Tianhe District Guangzhou, 637399 China"
^ Home page. Jinyi Cinemas. Retrieved on January 3, 2015. "广州金逸影视传媒股份有限公司 地址：广州市天河区珠江新城华成路8号礼顿阳光大厦4楼 邮编：510623"
^ "CHOW SANG SANG: Shining Return after 62 Years" (Archive). City of Guangzhou. Retrieved on May 9, 2014. ^ "Google locations." Google. Retrieved on May 25, 2016. "Google Guangzhou L30, Unit 3007, Teemtower, Teemmall, 208 Tianhe Road, Tianhe District, Guangzhou, 510620"
^ "ANA City offices Asia." All Nippon Airways. Retrieved on August 13, 2011. "Guangzhou Office [Until May 2nd, 2011] 2605 CITIC PLAZA 233 Tianhe North Road, Tianhe Ward, Guangzhou [From May 3rd, 2011] Room 1403, Tower A, Victory Plaza, No.103, TiyuXi Road, Tianhe District, Guangzhou, 510620"
^ "Contact Us." Renren Corporate. Retrieved on November 19, 2012. "Room A4001, China Shine Plaza, Linhexi Rd, Tianhe District, Guangzhou" – Chinese: "广州市林和西路9号耀中广场A塔40层4001–4003"
^ "联系方法." 56.com. March 23, 2006. Retrieved on November 18, 2012. "公司地址：广州市天河区中山大道89号天河软件园华景园区B栋6楼南01房"
^ "Security Message about Recent Protests at Emei Mountain (July 8, 2014)" (Archive). U.S. Consulate in Chengdu. Retrieved on May 17, 2015. "43 Hua Jiu Road, Zhujian New Town Tianhe District Guangzhou 510623"
^ "Japanese School of Guangzhou." City Weekend. Retrieved on January 12, 2015. "No.10, Fengxin Road, Tianhe District 广东省广州市天河区风信路10号"
^ "Home." Huamei-Bond International College. Retrieved on September 28, 2015. "地址：广州市天河区华美路２３号"
^ "家私电器齐全 尊贵小区 ." Xingye Real Estate Agency (兴业地产). Retrieved on September 16, 2016. "怡苑位置：怡苑小区（The Greenery）位于天河北体育东路的金利来后面。" (Archive) – Neighborhood is stated as "怡苑" – Address: "地址： 体育东路华阳街55–79号 "
^ Home page. American International School of Guangzhou. September 1, 2000. Retrieved on September 16, 2016. "55 Hua Yang Street, Ti Yu Road East, Tianhe District, Guangzhou, 510620, People's Republic of China"
Wikimedia Commons has media related to Tianhe District.